Muhammad Kutty Paniparambil Ismail (born 7 September 1951), better known by his stage name Mammootty is an Indian film actor and producer who works in Malayalam cinema. In a career spanning four decades, he has appeared in over 400 films, predominantly in Malayalam language and also in Tamil, Telugu, Kannada, Hindi and English. Mammootty was a lawyer by profession. After establishing himself as a lead actor in the 1980s, his major breakthrough came with the commercial success of the 1987 film New Delhi. He has won three National Film Awards for Best Actor, seven Kerala State Film Awards and thirteen Filmfare Awards South. In 1998, the Government of India awarded him the Padma Shri for his contributions to the arts. He has also received honorary doctorate degrees from the University of Kerala in January 2010 and from the University of Calicut in December 2010. Mammootty is the chairman of Malayalam Communications, which runs the Malayalam television channels Kairali TV, People TV and WE TV. He is also the goodwill ambassador of the Akshaya project, the first district-wide e-literacy project in India. He is the patron of the Pain and Palliative Care Society, a charitable organisation in Kerala formed with the aim of improving the quality of life among patients with advanced cancer. He has also been working with the Pain and Palliative Care Centre in Kozhikode, India. Mammootty with Fr. Palakkappilly at Sacred Heart College, Thevara where he did his pre-degree. Mammootty was born Muhammad Kutty Ismail Paniparambil on 7 September 1951 in Chandiroor in Alappuzha district, and raised in the village of Chempu near Vaikom in Kottayam district in the present-day state of Kerala, India in a middle-class, Muslim family. His father, Ismail, was a farmer and his mother, Fatima, a housewife. He was their eldest son. He has two younger brothers, Ibrahimkutty and Zakariah and three younger sisters, Ameena, Sauda and Shafina. Mammootty went to Government High School, Kulasekharamangalam, Kottayam for his primary education. In the 1960s, his father moved the family to Ernakulam, where he attended Government School Ernakulam. He did his pre-university course (pre-degree) at Sacred Heart College, Thevara. He attended Maharaja's College, Ernakulam for his degree. He graduated with a LL.B. from Government Law College, Ernakulam. Mammootty practiced law for two years in Manjeri. Mammootty married Sulfath in 1979, and has a daughter Surumi (born 1982), and a son Dulquer Salmaan (born 1986). Mammootty's younger brother Ibrahimkutty is an actor in Malayalam films and Malayalam TV serials. Ibrahimkutty's son Maqbool Salmaan is also a film actor. Mammootty shown with Ramachandra Babu, who served as cinematographer in his debut film, and actor Saiju Kurup. Mammootty's debut was in the 1971 film Anubhavangal Paalichakal, directed by K. S. Sethumadhavan. His second film was Kaalachakram, a 1973 Malayalam film directed by K. Narayanan. He acted in the theatre drama Sabarmathi in 1975. In 1979, he played his first lead role in Devalokam, directed by M. T. Vasudevan Nair. However, this film was never completed. His first credited role was in the 1980 film Vilkkanundu Swapnangal, directed by Azad and written by M. T. Vasudevan Nair. Mammootty's first starring role in a released film was the 1980 film Mela, written and directed by K. G. George. Mammootty's films in the 1980s include: Sphodanam (directed by P. G. Viswambharan), in which his name appeared in the credits as "Sajin (Mammootty)"; Munnettam (directed by Sreekumaran Thampi); and Thrishna (directed by I.V. Sasi). In 1981, he got his first state award in the Best Supporting Actor category for his performance in Ahimsa. His performances included Aalkkoottathil Thaniye and Adiyozhukkukal. He played the role of a police officer in the investigative thriller Yavanika (1982), directed by K. G. George, which was both a commercial and critical success. Other major releases in 1982 were Padayottam and Ee Nadu, which was a commercial success and became the highest grossing south Indian film at that time. Padayottam was the first 70 mm film Indian film to be completely processed in India. It was also the first Malayalam film with a budget over ₹1 crore (US$140,000). In a period of five years, from 1982 to 1987, Mammootty acted in the lead role in more than 150 films. In 1986 alone, he acted in about 35 films, including a brief appearance in Mazha Peyyunnu Maddalam Kottunnu. In the mid-1980s, he collaborated in what became known as the Mammootty-Kutty-Petty films. These films had Mammootty as the protagonist, a husband and a father, with a 3 or 4-year-old daughter, employed in a top ranking post in a company. Mammootty made a comeback with New Delhi and Thaniyavarthanam, both released in 1987. In New Delhi, he played a victimised journalist, who systematically took revenge on politicians who flattered him. He received the Kerala Film Critics Awards for Best Actor for his role as Balan Mash in Thaniyavarthanam, written by Lohithadas and directed by Sibi Malayil. In 1988, Mammootty starred in Oru CBI Diary Kurippu as a CBI officer. Following Oru CBI Diary Kurippu, three more murder mystery sequels were produced with the same cast of characters: Jagratha (1989), Sethurama Iyer CBI (2004) and Nerariyan CBI (2005), all directed by K. Madhu, penned by S. N. Swamy with Mammootty as Sethurama Iyer, an intelligent but unassuming CBI officer. Mammootty appeared in two of M. T. Vasudevan Nair's films with autobiographical elements—Aksharangal, directed by I. V. Sasi and Sukrutham, directed by Harikumar. Oru Vadakkan Veeragatha was directed by T. Hariharan and penned by M.T. Vasudevan Nair. Mammootty's depiction of a Chekavar (mercenary warrior) of distinguished valor, but vilified by circumstances, won him the National Film Award for Best Actor. His role as a hunter, Varunni in Mrigaya, directed by I.V. Sasi and another film Mahayanam, were also scanned for the State Award. Mammootty won the Filmfare award for Amaram directed by Bharathan, in which he played the role of an uneducated fisherman who dreams of making his only daughter a doctor. During this period, Mammootty appeared in many of the films directed by Adoor Gopalakrishnan including: Anantaram ("Thenceforth"), Mathilukal ("Walls") and Vidheyan ("The Servile"). His portrayal of the protagonist in Mathilukal (based on Mathilukal, a novel by the Malayalam novelist Vaikom Muhammad Basheer) was instrumental in getting him his first National Film Award for Best Actor. Mammootty also appeared in Adoor Gopalakrishnan's Vidheyan and T. V. Chandran's Ponthan Mada. He received the National Film Award for Best Actor and State Award for his roles in both films. Mammootty played the central character, a district collector, in the 1995 film The King, scripted by Renji Panikkar and directed by Shaji Kailas. In 1997, he won the Filmfare Award for Best Actor for the movie Bhoothakannadi, directed by Lohithadas. Mammootty won his third national award for Dr. Baba Saheb Ambedkar, an English language movie about the life of B. R. Ambedkar, directed by Jabbar Patel in 1999. The film was sponsored by the National Film Development Corporation of India and the Ministry of Social Justice and Empowerment. By the end of the 1990s, he acted in films such as Priyadarshan's Megham and Fazil's Harikrishnans, in which he co-starred with Mohanlal. Due to the immense popularity of both the actors, Fazil was forced to shoot two endings for the film– a first for Indian film. Mammootty started off the new millennium with Lohithadas's Arayannagalude Veedu in 2000. A critical and commercial success, it earned him the Filmfare Best Malayalam Actor Award. He portrayed Arackal Madhavanunni in Shaji Kailas's action thriller Valliettan, which was one of the highest-grossing films of the year. In 2001, he acted in two films including Dubai, one of the most expensive films ever made in Malayalam at that time. In 2002, he acted in three films. Chronic Bachelor in 2003 was a romantic comedy-drama film about the life of Sathyaprathapan (known as SP). The film was written and directed by Siddique and produced by Malayalam director Fazil. The film was released as a Vishu release in 2003 and ran for more than 115 days. In 2004, the third installment in the CBI series Sethurama Iyer CBI, marked Mammootty's comeback. Also in 2004, he won the state award for his portrayal of Madhavan in Blessy's Kazhcha. Ranjith's Black and V. M. Vinu's Vesham were also successful ventures. Mammootty had six releases in 2005, including Anwar Rasheed's directorial debut Rajamanikyam. He portrayed Bellary Raja, a Thiruvananthapuram-based cattle dealer in the film, which was the highest-grossing film of the year and highest grossing Malayalam film until 2008. In 2006, Mammootty won the Filmfare Best Actor Award for the movie Karutha Pakshikal, directed by Kamal. He also acted in I. V. Sasi's Balram vs. Tharadas, in which he reprised his roles as Inspector Balram from the 1991 Inspector Balram and Tharadas from the 1984 Athirathram. It was I. V. Sasi's 144th film, and a record 35th with Mammootty. In 2006, Mammootty continued his success with the film Thuruppu Gulan. Mammootty's action comedy Mayavi was released in 2007. He portrayed Dr. Nathan in Shyamaprasad in Ore Kadal (2007), and appeared in the same year in Big B. In 2008, Mammootty appeared in Annan Thambi. He played a police officer for 25th time in the film Roudram. He also starred in Kerala's Twenty: 20 in 2008, a benefit film with a cast of dozens. In October 2009, he acted in Pazhassi Raja, directed by Hariharan and written by M. T. Vasudevan Nair; it had a good opening weekend collection at the box office. He also acted in the short film Puramkazhchakal (directed by Lal Jose) from Malayalam's first portmanteau film Kerala Cafe. In 2009, he won his fifth state award for Best Actor for his performance in Ranjith's Paleri Manikyam. It was reported that he was shortlisted for the 2009 National Award for Best Actor, but lost the award to Amitabh Bachchan. The jury's decision was criticised by Shaji N. Karun, director of Kutty Srank and Ranjith, director of Paleri Manikyam. In the year 2010, Mammootty acted in the films Drona 2010, directed by Shaji Kailas, Yugapurushan, directed by R. Sukumaran, Pramaani, directed by B. Unnikrishnan, Pokkiri Raja, the directorial debut of Vysakh Abraham, Kutty Srank, directed by Shaji N. Karun, Pranchiyettan & the Saint, directed by Ranjith, Best of Luck, directed by M. A. Nishad (a cameo role) and Best Actor, Martin Prakkat's debut film. His films 15 August, directed by Shaji Kailas, Doubles, directed by Sohan Seenulal, The Train, directed by Jayaraj, Bombay March 12, directed by Babu Janardhanan and Venicile Vyaapari, directed by Shafi appeared in 2011. In 2012, his films included: The King & the Commissioner, directed by Shaji Kailas, the Kannada film Shikari, directed by Abhay Simha, Cobra, directed by Lal, Thappana, directed by Johny Antony, Jawan of Vellimala, directed by Anoop Kannan, (Mammootty produced the film), Face to Face, directed by V. M. Vinu and Bavuttiyude Namathil, directed by G. S. Vijayan. His first films released in 2013 were Kammath & Kammath, directed by Thomson and Immanuel, directed by Lal Jose. Later, he went on to appear in Kadal Kadannoru Mathukkutty, directed by Ranjith, which was released for Ramzan season, Kunjananthante Kada, directed by Salim Ahamed and Daivathinte Swantham Cleetus, directed by G. Marthandan.. His next release was Silence, directed by V. K. Prakash. He acted in Balyakalasakhi, directed by Pramod Payyannur, Praise the Lord, directed by Shibu Gangadharan and Gangster, directed by Aashiq Abu in the first half of 2014. He also acted in: Manglish, directed by Salam Bappu, Munnariyippu, directed by Venu, RajadhiRaja, directed by debutant Ajai Vasudev and Varsham, directed by Ranjith Sankar. Mammootty received critical praise for his portrayal of C.K. Raghavan in Munnariyippu, while Sify called RajadhiRaja "a genuine hit for Mammootty after a long time". Nicy V.P of International Business Times wrote: "Varsham is a movie worth investing your time and money." His 2015 releases were Fireman, directed by Deepu Karunakaran, Bhaskar the Rascal, directed by Siddique, a commercial success, Acha Dhin, directed by Marthandan. Utopiayile Rajavu, directed by Kamal and Pathemari, directed by Salim Ahamed, were both commercial and critical success. 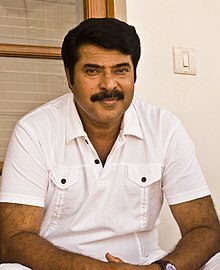 Mammootty has acted in a few non-Malayalam movies and these include some Tamil, Telugu, Hindi, Kannada and English films. In 1990, he made his Tamil debut in Mounam Sammadham, directed by K. Madhu. He has acted in Tamil films for directors including K. Balachander's (Azhagan), Mani Ratnam's (Thalapathy), Fazil's (Kilippechu Kekkavaa), N. Linguswamy's (Aanandham), R. K. Selvamani's (Makkal Atchi), Henri's (Marumalarchi) and Ethirum Puthirum and Rajiv Menon (Kandukondain Kandukondain) (1993). He played the role of Anantha Sharma in K. Vishwanath's Telugu film Swathi Kiranam (1992). He acted in the Kannada-Malayalam bilingual film Shikari in 2012. He made his debut in Hindi films through Thriyathri, which was released in 1989, though his first film as a leading actor was Dhartiputra. He starred in the biographical film Dr. Baba Saheb Ambedkar, directed by Jabbar Patel, which was in English. He also appeared in Sau Jhooth Ek Sach (2004). During the 2006 IIFA Awards ceremony held at Dubai, he openly criticised the organizers of the IIFA Awards for completely ignoring South Indian film by stating that the Bollywood film industry should stand up to competition from the South Indian film industry before calling itself international. Mammootty has had many of his Malayalam films dubbed into Telugu and Tamil cinema such as Doubles, Chattambinaadu, Parunthu, Annan Thambi, Thommanum Makkalum, Sethurama Iyer CBI and Pazhassi Raja among others. Mammootty is the patron of the Pain and Palliative Care Society, a charitable organisation in Kerala, formed with the aim of improving the quality of life among patients with advanced cancer. He has been working with the Pain and Palliative Care Centre situated in Kozhikode, India. Mammootty has now[when?] put forth a novel project to provide the pain and palliative care to those suffering from cancer throughout Kerala. Mammootty is the goodwill ambassador of the charity project Street India Movement, which is aimed at the eradication of child begging and child labour. He has promoted the activities of the movement, which networks with orphanages and institutions looking after the children. Kazhcha is a venture to extend free eye care and treatment organised by Mammootty Fans Welfare Association and Mammootty Times, in association with Little Flower Hospital and Research Centre and the Eye Bank Association of Kerala. One of the major activities related to this is the distribution of free spectacles to children. A special fund received from the office of the President of India will be utilised[when?] for this purpose. Free eye camps will also be conducted at various places in connection with this project. Akshaya, the information technology dissemination project of the Government of Kerala, has Mammootty as its goodwill ambassador. He formally took over the role on 26 February 2006 at a video networked programme which was linked to all the district headquarters of the state. Mammootty is a patron of the Care and Share International Foundation, a charity organisation working towards removing the inequalities in society. The foundation has done many notable humanitarian works including the recent Hridaya Sparsham project, to mobilise help for the heart surgery of children. Mammootty's plea over social networking sites raised about ₹ 1 crore within a day. In August 2014, Mammootty launched the My Tree Challenge as a response to the popularity of the Ice Bucket Challenge. Its purpose is to encourage others to plant saplings, as the rules dictate they should if they are challenged. My Tree Challenge was kick-started by two environment lovers, Abdul Manaf, an entrepreneur, and Imthias Kadeer, a travel photographer. It was actor Fahadh Faasil who first challenged actors Mohanlal and Mammootty to take up the challenge. As of 2010, Mammootty is the Chairman of Malayalam Communications, which runs some Malayalam TV channels such as Kairali TV, People TV and Channel We. He co-owned a production company during the 1980s, Casino, along with Mohanlal, I.V. Sasi, Seema and Century Kochumon. The production house produced commercially successful films such as Nadodikkattu, Gandhi Nagar 2nd Street, Adiyozhukkukal and Karimpin Poovinakkare. He formed a television production company, Megabytes, which produced television serials, the first being Jwalayay in the late 1990s, which was also his first project as a producer. He also owns a distribution company named Mammootty Technotainment. In 2005, Mammootty, Mohanlal and Dileep accounted for 97% of the box-office revenue of Malayalam cinema. Mammootty has joined with the Kerala State Beverages Corporation to promote the anti-drug campaign Addicted to Life. The project, launched by the Government of Kerala aims to eradicate the drugs and alcohol usage among people— especially youth. Mammootty was appointed as the brand ambassador of the Thrissur-based South Indian Bank on 16 October 2006. He was also featured as the brand ambassador for Kerala Volleyball League. Dubai-based businessman MA Yousuf Ali and Mammootty met with the officials of the Dubai Internet City (DIC) to lobby for the proposed Smart City project at Kochi. Mammootty wrote his first book Kazhchapadu (roughly translated as "Perspective"), a compilation of short essays he has written in various publications over the years. The distribution company Playhouse Entertainments is owned by Mammootty. Some of the films distributed by the company are Chattambinadu, Ritu, Three Kings, Living Together, Neelathamara, Pranchiyettan & the Saint, The King and the Commissioner and Cobra. In 2013, his role in Mathilukal was listed among 25 greatest acting performances of Indian cinema by Forbes India on the occasion of celebrating 100 years of Indian Cinema. Mammootty has won three National Film Awards, five Kerala State Film Awards, thirteen Filmfare Awards, eleven Kerala Film Critics Awards and five Asianet Film Awards (from fourteen nominations). In 1998, the government of India honoured Mammootty with its fourth highest civilian award, Padma Shri for his contribution to the Indian film industry. He was conferred with the Doctor of Letters degree by University of Calicut and University of Kerala in 2010. ^ "Government of India, Directorate of Film Festivals - National Film Festival 1994 - Document Page number 35" (PDF). Archived from the original (PDF) on 28 September 2011. Retrieved 30 July 2011. ^ "Happy 62nd birthday Mammootty: What makes him Malayalam cinema's superstar". CNN-IBN. 7 September 2013. Archived from the original on 16 March 2014. Retrieved 16 March 2014. ^ a b "Mammootty Back in School - revealing his birth place is Chandiroor". Archived from the original on 13 February 2017. Retrieved 18 February 2016. ^ "'AMMA' Address Of Stars". 'AMMA'. Archived from the original on 9 June 2017. Retrieved 5 February 2018. .
^ a b "അഞ്ച്‌ രുചി വിശേഷങ്ങളും മമ്മൂട്ടിയും". mangalam.com. Archived from the original on 28 July 2014. Retrieved 13 August 2014. ^ "10 Mammootty films to watch before you die". Times of India. 24 May 2016. Archived from the original on 30 May 2016. Retrieved 1 June 2016. ^ "Padma Shri Awardees". Government of India. Archived from the original on 21 July 2011. Retrieved 10 July 2011. ^ a b "D.Litt. for Adoor, Mammootty, Umayalpuram Sivaraman". The Hindu. Chennai, India. 14 January 2010. Archived from the original on 24 January 2010. ^ a b "Calicut University confers D.Litt. on Mammootty". The Hindu. Chennai, India. 3 December 2010. Archived from the original on 6 December 2010. ^ "Malayalam Communications Board of Directors]. Kairalitv.in". 1 November 2004. Archived from the original on 1 July 2010. Retrieved 30 October 2007. ^ a b "Mammootty enlivens Akshaya network". The Hindu Businessline. 26 February 2006. Archived from the original on 7 February 2009. Retrieved 30 October 2007. ^ "Annual Report 2001". painandpalliativecare.org. Pain and Palliative Care Society. July 2007. Archived from the original on 6 January 2016. Retrieved 30 October 2007. ^ "Relevance of the Pain and Palliative Care Society". painandpalliativecare.org. October 2006. Archived from the original on 6 January 2016. Retrieved 30 October 2007. ^ a b Irene Eapen (30 March 2009). "The Veteran Hero of Malayalam Industry". Archived from the original on 19 October 2007. Retrieved 1 June 2016. . OneIndia Entertainment. ^ "Mammootty's profile". cinediary.com. Archived from the original on 6 January 2016. Retrieved 3 June 2015. ^ "Mammootty – A lawyer?". Archived from the original on 5 November 2017. Retrieved 5 June 2016. ^ Kurian, Shiba (4 January 2012). "I never wanted to use my uncle's identity: Maqbool Salman". The Times of India. TNN. Retrieved 12 December 2012. ^ "Anubhavangal Paalichakal". The Hindu. Chennai, India. 25 March 2011. Archived from the original on 24 August 2011. Retrieved 28 April 2011. ^ "എന്ത് പൗളിയോ? ഞങ്ങളൊന്നിച്ച് നാടകം കളിച്ചിട്ടുണ്ട്, ഇങ്ങോട്ട് വിളിക്കൂ: ആദ്യ സിനിമയില്‍ തന്നെ ഞെട്ടിച്ച മമ്മൂക്കയെക്കുറിച്ച് മികച്ച സഹനടി പൗളി വില്‍സണ്‍". www.mangalam.com. ^ "മമ്മൂട്ടി എന്നെ മറന്നെന്നാണ് കരുതിയത്, പക്ഷേ; പൗളി വൽസൻ". ^ a b "Mammootty completes his 300" Archived 9 July 2012 at the Wayback Machine. Indiaglitz.com. Retrieved 10 July 2011. ^ "How Mammootty became Sajin, Lal Jose recalls". OnManorama. Retrieved 3 November 2018. ^ Venkiteswaran, C.S. (26 October 2017). "The End of an Epoch". the hindu.com. Archived from the original on 5 November 2017. Retrieved 5 November 2017. ^ "A classic called 'Yavanika'". The Hindu. 19 November 2007. Archived from the original on 5 November 2017. ^ "Murder and the Malayalee". Sify. 5 August 2014. Archived from the original on 24 December 2015. ^ "The cinematic journey of K G George". The News Minute. 12 March 2017. Archived from the original on 9 August 2017. ^ "Poor patchwork". India Today. 15 September 1983. Archived from the original on 9 August 2017. ^ "Padayottam". www.malayalachalachithram.com. Archived from the original on 23 October 2014. Retrieved 16 October 2014. ^ "Big is bountiful". India Today. 15 April 1982. Archived from the original on 22 December 2015. ^ "Mammooty introduced to films by MT Vasudevan Nair". mtvasudevannair.com. Archived from the original on 22 August 2011. Retrieved 28 April 2011. ^ Friday Review Thiruvananthapuram : 'An incomparable writer' Archived 7 November 2012 at the Wayback Machine. The Hindu (3 July 2009). Retrieved 15 August 2013. ^ "Mammootty Awards". filmbeat.com. Archived from the original on 11 November 2016. Retrieved 5 November 2017. ^ a b c "MAwards"
^ "'I've given my best' April 1997 Mammootty". Archived from the original on 24 April 2016. ^ "Dr Babasaheb Ambedkar-Movie Preview" Archived 8 November 2007 at the Wayback Machine. ambedkar.org. Retrieved 30 October 2007. ^ "Hari gets Meera, so does Krishnan in Fazil's Harikrishnans". The Indian Express. 12 September 1998. Archived from the original on 5 November 2007. Retrieved 28 April 2011. ^ A. Swamy. "Malayalam Cinema 2000: A Flashback". Indiainfo. Archived from the original on 6 April 2003. Retrieved 14 April 2011. ^ "Action films are his forteasari" Archived 20 December 2010 at the Wayback Machine. Screen India. 27 November 2000. Retrieved 14 April 2011. ^ Unni R. Nair (4 January 2002). "Let down". Screen India. Archived from the original on 29 December 2007. Retrieved 28 April 2011. ^ "Malayalam Movies". Archived from the original on 19 March 2014. ^ Sreedhar Pillai (31 December 2004). "Year 2004 – a flashback". The Hindu. Archived from the original on 26 August 2010. Retrieved 28 April 2011. ^ Sreedhar Pillai (30 December 2005). "Boom year for mollywood". The Hindu. Archived from the original on 26 September 2008. Retrieved 28 April 2011. ^ "A crime thriller from I.V. Sasi". The Hindu. Chennai, India. 2 May 2006. Archived from the original on 6 January 2016. Retrieved 28 April 2011. ^ Kerala Box Office – 28 September to 20 October Archived 24 October 2009 at the Wayback Machine. Sify. 21 October 2009. Retrieved 4 January 2009. ^ Sangeeta (16 October 2009). "A heady brew". The Hindu. Chennai, India. Archived from the original on 6 January 2016. Retrieved 28 April 2011. ^ അവാര്‍ഡ് പ്രഖ്യാപനത്തിന് പിന്നാലെ വിവാദങ്ങളും [National award creates controversy]. Mathrubhumi. 15 September 2010. Archived from the original on 18 September 2010. Retrieved 15 September 2010. ^ "The 5 Worst Malayalam films so far". Rediff.com. 3 July 2014. Archived from the original on 19 October 2014. ^ "'Munnariyippu' Review Round up: Mammootty Starrer Rated as One of the Best". International Business Times. 22 August 2014. Archived from the original on 28 August 2014. ^ "Kerala Box-Office – September". Sify. 8 October 2014. Archived from the original on 9 October 2014. ^ "'Varsham' Review Roundup: Ranjith's Direction and Mammootty's Performance Impress Critics". International Business Times. 6 November 2014. Archived from the original on 9 November 2014. ^ "2015 in review: Malayalam cinema brings viewers back to theatres..." Mathrubhumi. 26 May 2016. Archived from the original on 5 June 2016. ^ South-pawed! Archived 25 February 2008 at the Wayback Machine. The Hindu. Friday, 7 July 2006. Retrieved 19 June 2009. ^ "Mammootty Movies". nowrunning.com. Archived from the original on 19 December 2016. Retrieved 5 November 2017. ^ Form of Kerala[permanent dead link] amazon news. ^ Mammootty for a cause Archived 6 January 2016 at the Wayback Machine The Hindu Friday, 14 July 2006. Retrieved 19 June 2009. ^ "Kazhcha 06-07 – free eye care & treatment". Mammootty.com. 13 July 2006. Archived from the original on 20 August 2007. Retrieved 30 October 2007. ^ "Star shines on Project Akshaya". KeralaITmission.org. 25 February 2006. Archived from the original on 4 August 2007. Retrieved 30 October 2007. ^ Mammootty as brand ambassador has helped Akshaya gain publicity Archived 6 January 2016 at the Wayback Machine. The Hindu. 3 November 2006. Retrieved 30 October 2007. ^ "Actor wins a hundred hearts". The Hindu. Chennai, India. 2 March 2011. Archived from the original on 7 March 2011. Retrieved 4 March 2011. ^ Thomas, Elizabeth (29 August 2014). "The new challenge, 'My Tree Challenge'". Deccan Chronicle. Archived from the original on 30 August 2014. Retrieved 30 August 2014. ^ Prakash, Asha. "Mammootty takes up Fahadh's Tree challenge, challenges Shah RuKh, Vijay and Suriya". The Times of India. Archived from the original on 2 September 2014. Retrieved 31 August 2014. ^ "Malayalam Communications Board of Directors". Archived from the original on 9 April 2010. Retrieved 2013-08-15. CS1 maint: BOT: original-url status unknown (link). "kairalitv.in". 1 November 2004. Retrieved 30 October 2007. ^ Mega Serials Mega Hits Archived 15 October 2007 at the Wayback Machine. Rediff.com. 28 October 2006. Retrieved 30 October 2007. ^ "Why should they? Especially when they are busy producing a superhit television soap" Archived 12 April 2011 at the Wayback Machine. Rediff.com. 21 December 1998. Retrieved 30 October 2007. ^ "Mammootty in Wise Technotainment Trick". Indiainfo.com. March 2002. Archived from the original on 25 August 2007. Retrieved 19 June 2009. ^ "Mammootty Promotes Addicted To Life Campaign". www.filmibeat.com. Archived from the original on 4 September 2014. ^ South Indian Bank Announces Mammootty as Brand Ambassador Archived 29 October 2007 at the Wayback Machine. SouthIndianBank.com. 16 October 2006. Retrieved 30 October 2007. ^ South Indian Bank has appointed Padmasree Bharat Mammootty as Brand Ambassador. moneycontrol.com. 16 October 2006. Retrieved 30 October 2007. ^ "Kerala Volleyball League formed – Mammootty as brand ambassador". Business Line. 4 November 2009. Archived from the original on 2 January 2011. ^ "Mammootty brings IT park to Kerala". ibnlive.com. IANS. 14 April 2007. Archived from the original on 27 December 2008. Retrieved 30 October 2007. ^ Meet Mammootty, the writer Archived 12 November 2007 at the Wayback Machine. Rediff.com. 16 August 2006. Retrieved 30 October 2007. ^ "Kerala State Film Awards 2009". Winkerala.com. 6 April 2010. Archived from the original on 23 July 2012. Retrieved 22 April 2010. ^ "Mammootty turrns producer". The Times of India. 7 September 2011. Archived from the original on 23 January 2016. ^ Padma Shri Award recipients list Archived 29 April 2012 at the Wayback Machine. India.gov.in. Retrieved 10 July 2011. ^ "46th National Film Awards, 2000". Archived from the original on 19 August 2012. ^ "National Film Awards: Amitabh or Mammootty?". News18.com. Archived from the original on 2 February 2018. Retrieved 1 February 2018. ^ "Directorate of Film Festival" (PDF). iffi.nic.in. Archived from the original (PDF) on 18 October 2014. Retrieved 19 January 2011.